Guitar chords jangle through the room as I lifted a bottle of cold Red Horse to my mouth. The notes progressed into a verse and the crowd started to clap and cheer. 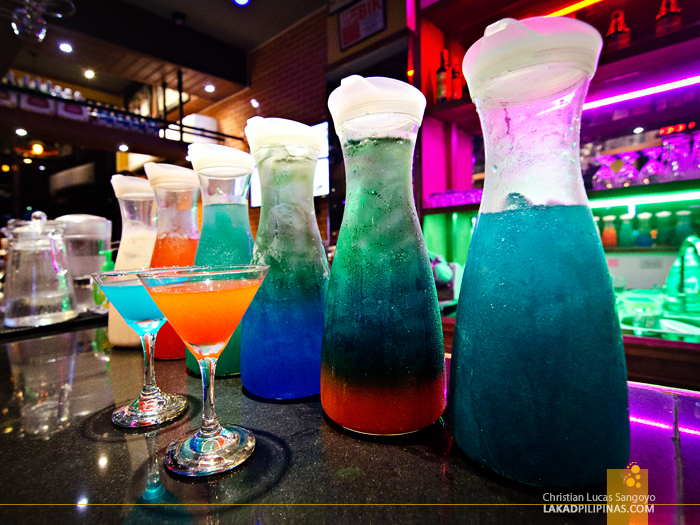 It was almost nine in the evening and I was at the second floor of a posh bar somewhere along Parañaque City’s Airport Road; J.J. Sports Bar. 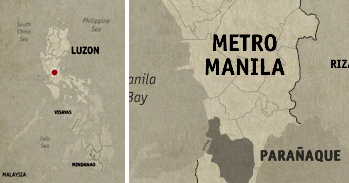 Craving for plate of classic Maty’s Tapsilog in Don Galo, my feet led me to the streets of Parañaque City once more. It was a long way from where I live but I simply have to sate my cravings before it drives me mad; it has been years since I’ve had it. 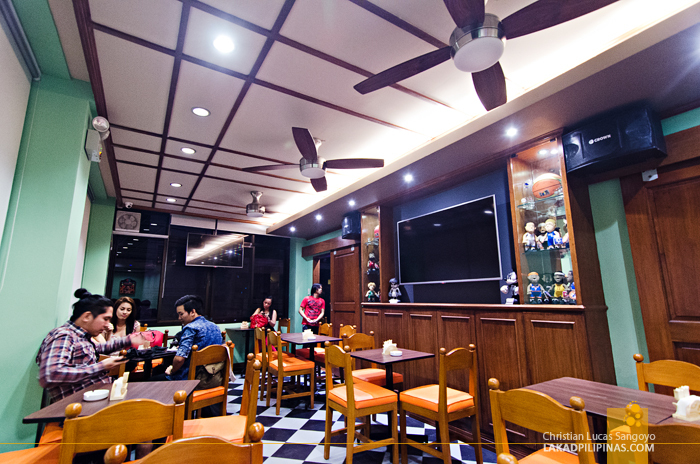 With nothing else to do right after, I decided to check out J.J. Sports Bar, a restobar I visited a few months back when I arrived too early at the NAIA Terminal 4 for a flight. My timing was spot on, it seems they’ve got something new up their sleeves; an acoustic night! 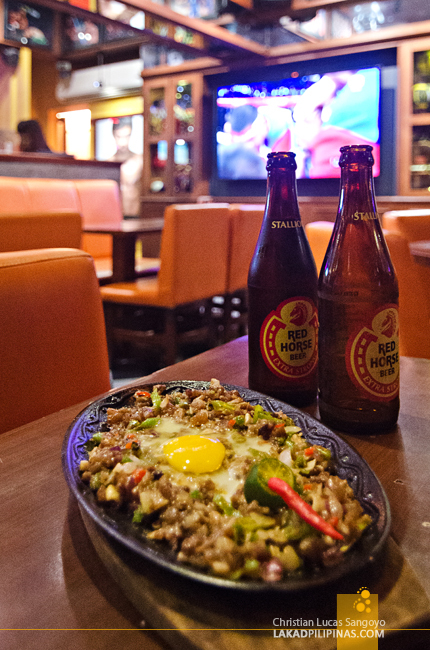 Ordering a bucket of Red Horse (Php250.00 during happy hour, 5:00PM to 8:00AM / 5:00AM to 9:00AM with free pulutan) with a sizzling plate of sisig (Php265.00), I comfortably seated myself at the ground floor of the restobar. While waiting for the bands to arrive, I caught up with a Pacquiao fight I missed (as I’m usually out of town during the weekends) on their 75-inch monster TV. It didn’t take long before I saw musicians entering the bar’s double doors and head up a flight of stairs. J.J. Sports Bar has been doing some expansions it seems; they now have a second floor! I quickly followed and was surprised to find a 65-seater area with a central stage for acoustic bands. 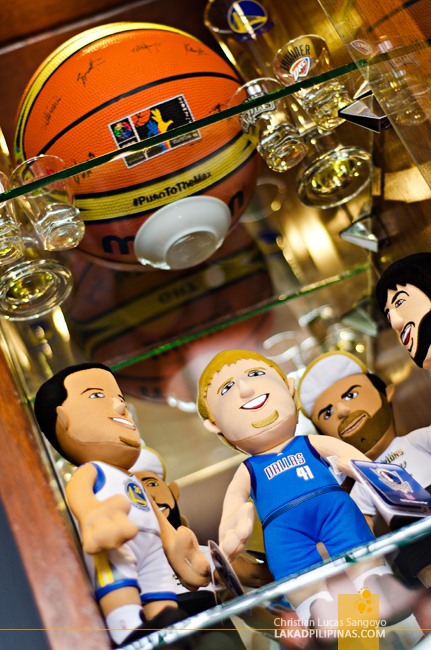 Like its main floor, J.J.’s second floor area is also replete with sports memorabilia; Pacquiao-signed punching bags, NBA plush toys and Gilas-signed basketballs among others. 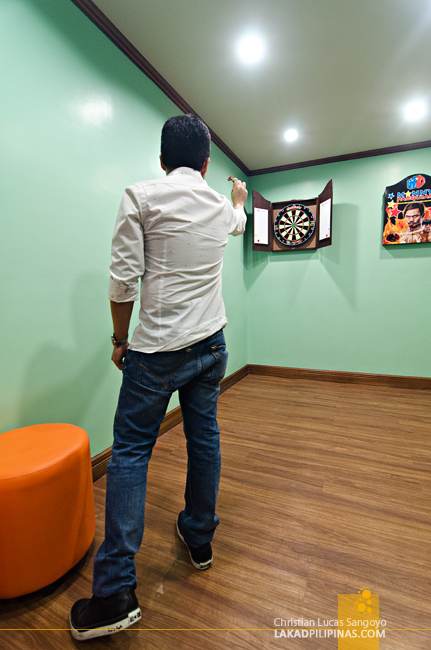 They even have a darts area (twice a month competition in the works). 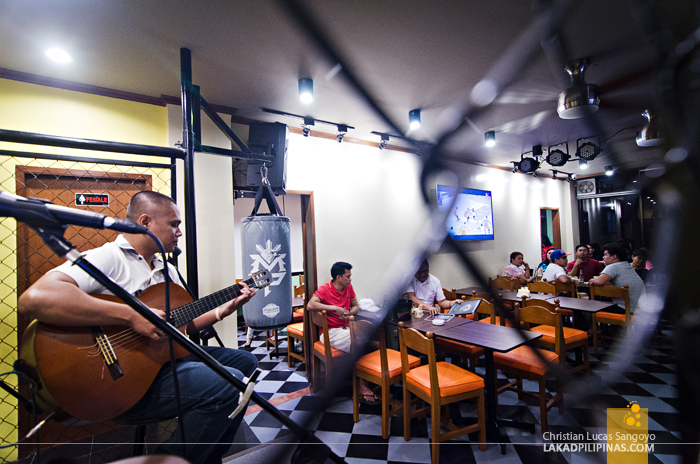 This part of J.J.’s is open during Wednesdays to Saturdays—but if the ground area is full, they usually open it up to accommodate their guests too—acoustic nights everyday except Saturdays, which is stand-up comedy night. I wasn’t even finished with my third drink when the first band went up the UFC-inspired stage and started belting out some classic ballads. Their name, Rhythm@Night, perfectly suited the atmosphere that evening . I tapped my foot in sync with the music while enjoying the latter half of my bucket. 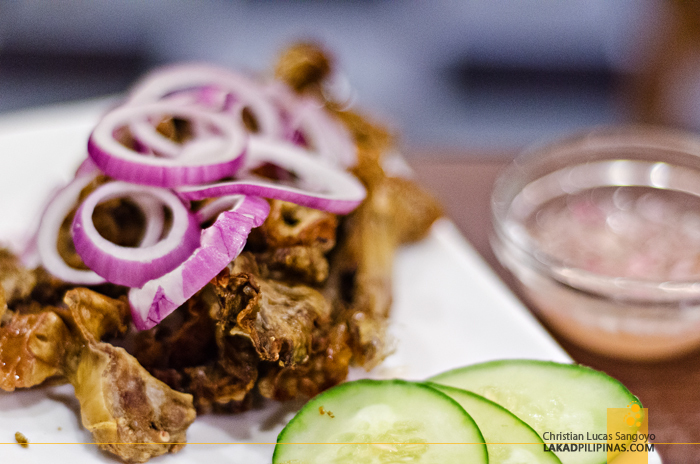 I can’t believe my sisig was gone too soon though; a plate of chicharon bulaklak soon came sliding down my table, pampabata as they say, haha. After a couple of songs, a new band took up the stage, Acoustic Note. 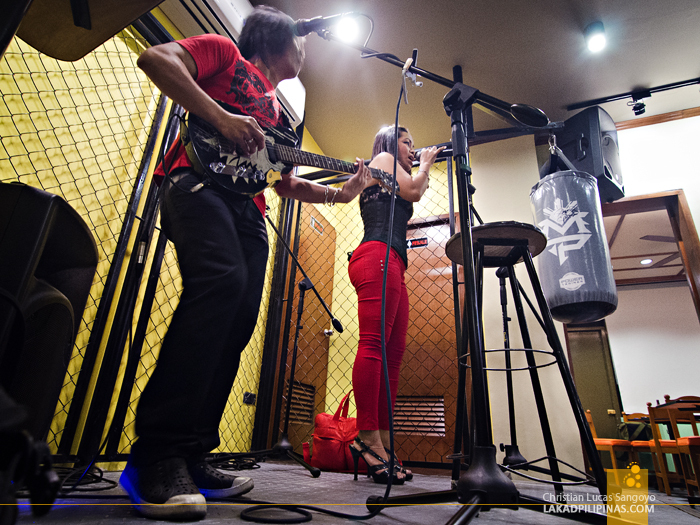 At first, I thought they were all regular musicians at J.J. Sports Bar, but it seems that I was on audition night. I can tell that each band was doing their best to impress the crowd. The last band to perform was Third Party, which comprises of four kids, they’re literally teeny-bopper young. 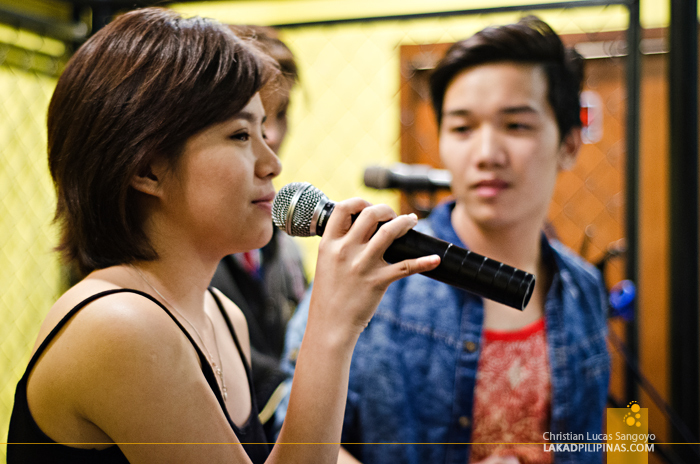 I was kinda rooting for them since their vocalist was quite pretty, and well, they’re perform rather well too. The second floor was packed as midnight struck and the band sang their last tune. 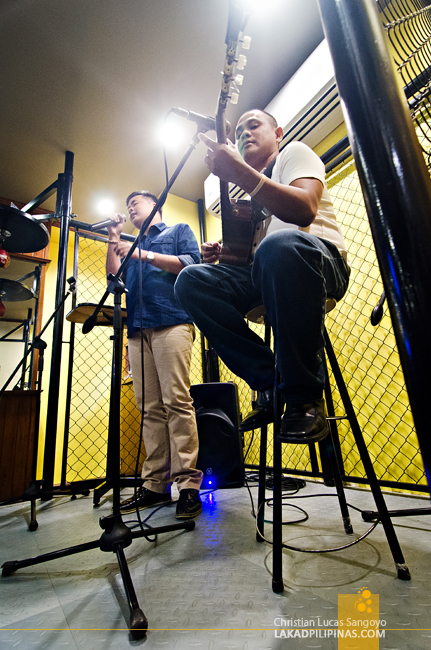 I was almost out of beer and definitely out of pulutan, but I just have to know who won the slot for the Friday Acoustic Nights at J.J. Sports Bar. And soon enough, the Acoustic Note duo came back to the stage to much cheers and applause. To be quite fair, they really did well, not only in performing, but in making the crowd laugh to the antics of their vocalist as well. 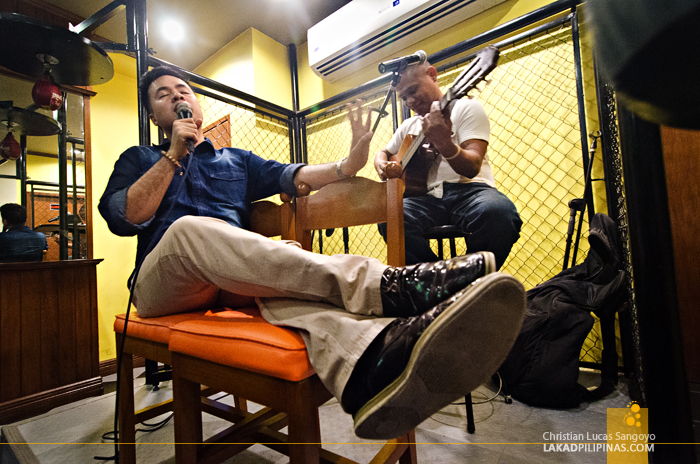 I miss these kind of nights where I just simply flop on a comfy chair, pig out on pulutan and booze myself silly while watching an acoustic show. 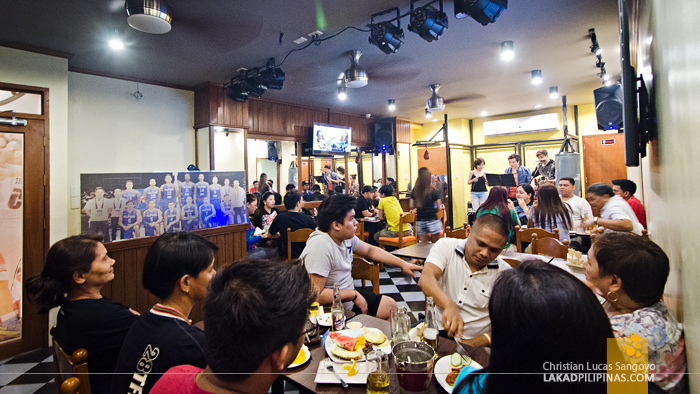 Next time, I’ll definitely find another excuse in going all the way to Parañaque, like perhaps booking another plane flight in the wee hours of the morning and crashing in at J.J. Sports Bar before going to the airport.